Realising excellent projects, those projects that exceed the expectations of the brief and become exemplars for their field, relies on the assembly of excellent teams, performing to an excellent standard and underpinned with a healthy and expert attitude to risk. As engineers we take great care to position and pitch ourselves to collaborate with culturally compatible experts and participate on projects that strive for built environment excellence. 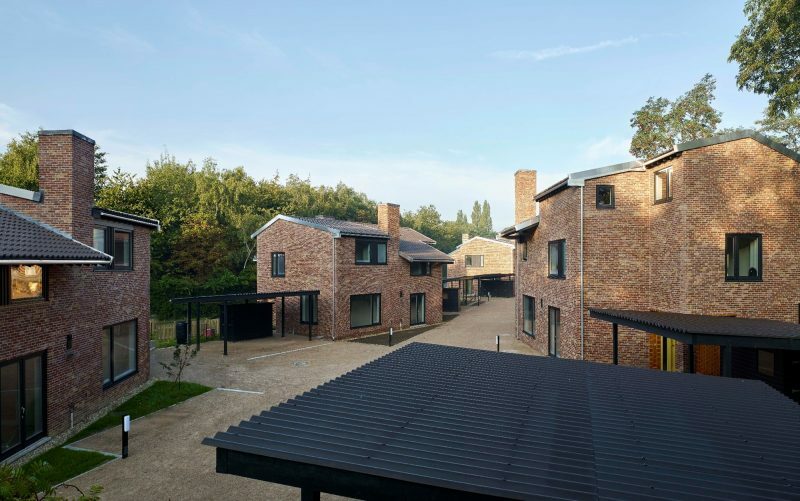 The last twelve months has seen the completion of two housing projects we engineered that are being held up as high quality benchmarks of residential design. The projects at The Malings, Ouseburn and North Lane, Aldershot are examples where we have worked very closely with the project sponsor and architect from initial concept through to delivery on site, advising, debating and detailing all engineering aspects of the scheme, from the movement & access; topography & levels; landscape & drainage; and structures & materials. In our experience it is this complete and coherent engineering service that yields the best value for projects, offering better and more attractive lifestyles for new inhabitants, seamlessly and sensitively settling into the prevailing geography and generating the best returns for the project developers and funders. It is clearly more challenging designing schemes from first principles, respecting all the experience that each party and stakeholder brings to the discussion, but more importantly it is being prepared to explore alternative methods and techniques in a trusting, supporting and nurturing team environment. 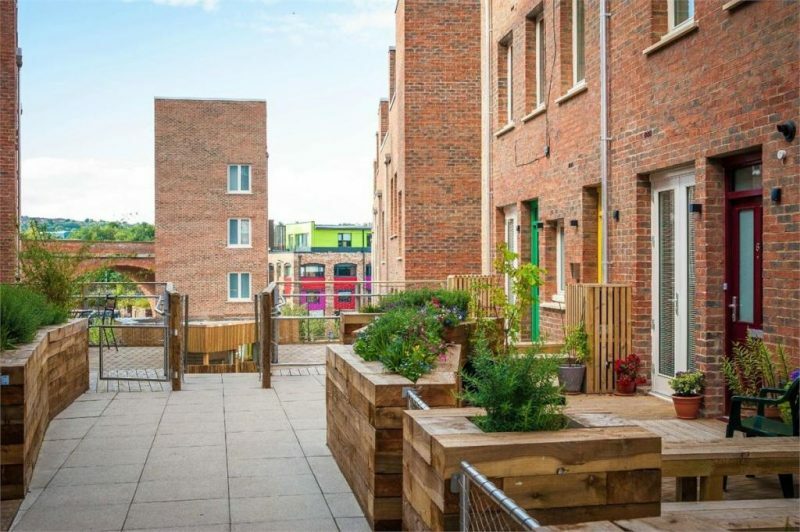 The Malings in Ouseburn is located in a thriving neighbourhood stretched out along the flanks of the river Ouse within walking distance to Newcastle city centre. The footprint of the site is defined by a steeply sloping embankment, enclosed by a highway viaduct, tipping into the river on its lower edge. The chequered industrial uses that occupied the site in its past presented the now familiar engineering legacy of buried obstructions and contamination. However these constraints and associated complexity have been showcased to highlight the character, distinctiveness and interest of this perennially redeveloped pocket of brownfield. Dealing with the site’s historic contamination and protecting the rivers substantial retaining structures in a creative manner has resulted in a composition of buildings and streets creating a coherent and carefully considered place. The scale, order and proportion of the buildings, position of front doors and windows, with spaces between that prioritise walking and dwelling, incorporating properly functioning water rills and rain-gardens while maintaining controlled access for vehicles, strikes the delicate balance between community, privacy and beauty founded on this new settlement’s environmentally respectful credentials. North Lane in Aldershot, located on the town’s fringe and tightly enclosed by a railway embankment and an A road does not offer an obvious advantage of aspect, orientation or other underexploited inspirational site feature. What unlocks its potential is the interplay between the individual homes, their individual relationship their immediate setting, but most revealingly is the value of the combined landscape and how residents can engage with each other across and in this versatile space. Creating this space is a function of positioning of the buildings on plan, however optimising this hard working space is realised through the choice of materials, manipulation of levels and downplaying of reluctantly accommodating vehicles. Both of these schemes bring with them a stimulating and functional setting for residents to positively interact socially, with a much greater, attractive opportunity to occupy the outdoor spaces and contribute to the sense of community. Our role as engineer has been critical in realising this potential, providing a creative and dynamic force in the team with a clear and focused understanding of place and considering high quality resident experience as the ultimate goal. Civic engineering.